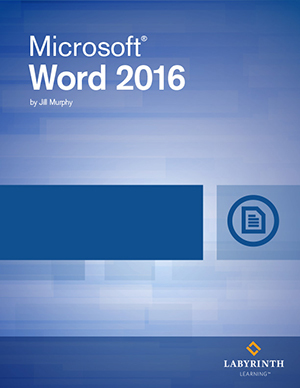 Microsoft Word 2016 Comprehensive: This in-depth courseware will equip students with a thorough knowledge and understanding of the most relevant features and uses of Word 2016. This textbook carries the ExamReadyTM certification which certifies that it has been tested by ProCert Labs to validate that it covers all course objectives included in the Microsoft Office Specialist (MOS) certification exam. DELIVERY OPTION: This option is for the digital download edition including the ebook and eLab. Does not include Full Color Textbook. Creating Business Reports - Arranging Text in Columns, Tab Stops, Headers & Footers and more. Average Rating: 1 on 1 ratings.